It’s been awhile but I’m finally back on the ball with another post for December. My has the time flown this year but I’m very confident I’ll be closing out 12 more months of making at least my minimum quota for posts. A small triumph for a year, but it does put some serious pressure on me at various times trying to juggle all my other commitments. Luckily, this is as much fun as it is work! Today I bring you another check in the birding list. 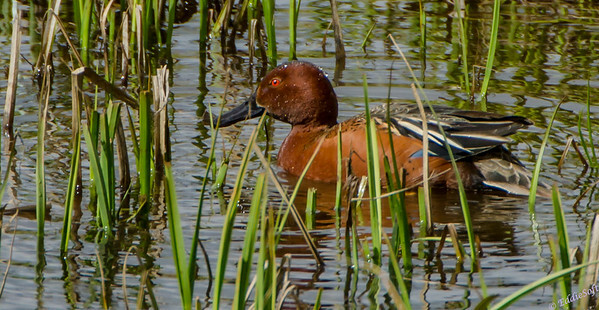 If you are not a birding enthusiast you may not recognize this as a Cinnamon Teal. This is a new Teal check having had the Blue-Winged Teal (link here) and the Green-Winged Teal (link here) previously. This is one of those checks I’ve known was in the tin for a long time. It was actually shot at Yellowstone National Park back in May of 2013. The fact that you are seeing the products from that trip signifies a very big accomplishment – yes, I FINALLY got through the entire collection of shots from that Yellowstone visit. Pretty sure I ran around the house in jubilation when I made it through the last of those pictures in the digital darkroom. I used to catch a lot of grief from my brother about the huge delays from shutter snap to post — now that he has turned birder extraordinaire he is experiencing the same kind of backlog (isn’t easy is it hehehe). Sometime ask him how many +1’s he has in the tin this year that has not been processed. 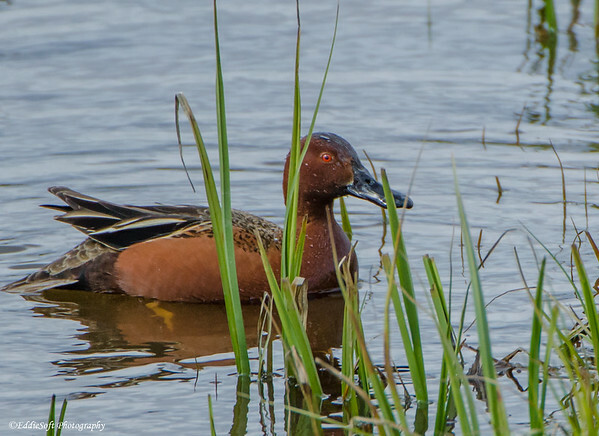 Hit the jump to see a few more shots of the Cinnamon Teal! I do not deny he is one of the reasons for finally pushing through the backlog – he’s been racking up new bird after new bird forcing me to at least get to the backlogged birds just to keep sight of his list number. These were the only two ducks in that particular pond. I’d like to say we hiked for miles in rocky terrain fending of bears and wilting under the beating sun to bring you these shots….but that would be a ummmm well, a total lie. From a birding perspective this was nirvana. Linda pulled into a parking lot, I got out and meandered about 20 feet to the pond where these two were hanging out in the reeds. The only downside is I had the tele on the Beast which resulted in some softness – a common theme for the Yellowstone trip. I learned a valuable lesson that year – only put the tele on if you really need that extra reach because it is going to go soft on you regardless of what the marketing material might tell you. Our buddies over at Cornell are lacking in their Cinnamon Teal content. There is very little I can bring to you from a facts perspective. They are dabblers and they do an excellent job of concealing their nests. They have separate breeding groups in North and South America (latter has a year long population). That’s about it folks – surprising little fanfare for such a beautiful bird. Stay tuned folks, there’s plenty more heading your way! Nice pics of a pretty bird! These pictures don’t look soft to me, but maybe they are when they are enlarged. 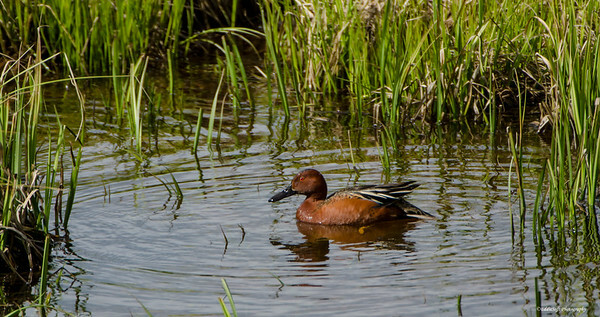 I only have one set of pics of a Cinnamon Teal, male only, from last spring at Midewin National Tallgrass Prairie. I had read an IBET post about one being there, and I spent over 3 hours looking for it along the river, etc., and was just leaving when I started talking to another birder and he said it was just up a path. So it was MUCH more of an ordeal for me than you, which offsets the poor shots I got of it in the distance. I did get a nice shot of it flapping its wings and later taking off. As I say, I haven’t seen one before or since. I still give you a hard time about being so far behind in processing pics, despite my various unprocessed collections dating back to last March (I do have some of them processed, though). 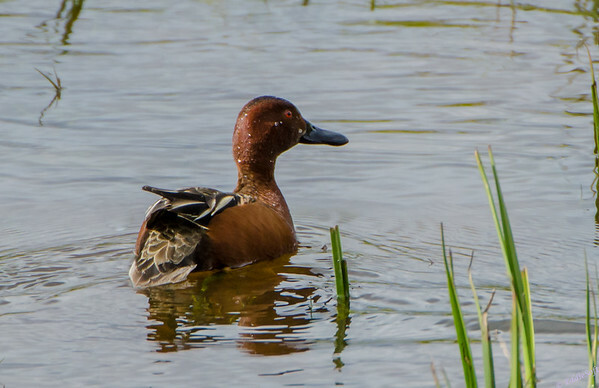 Anyway, thanks for the Cinnamon Teal pics! Ummm part of the “ordeal” is finding it. Unfortunately we were not in Chicago where everyday there are like 20 IBET posts of rare birds in the area – almost like shooting birds in a barrel (to bastardize a common saying) hehehe. Regardless how it got on the list it still a good add for each of us! The size reductions that take place for this blog does provide a pseudo sharpening effect as the soft pixels edge pixels get refined a bunch.